Many GPS devices are coming with built-in (or bundled) navigation software and does not allow you to install newer version or use the device in any other way that the original menu allows. This, of course doesn't mean that the device is not CAPABLE of running most of the applications. After all - it is running on Windows CE platform. 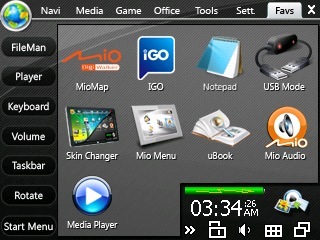 Googling a bit lead me to a project called MioPocket. This is a software that patches your mobile windows and installs lots of (freeware) utilities (media player for example) that can really upgrade your usage of the device. One of the best features (and of course the main reason why those people wrote this utility) is that it enables you to run any navigation software. Continue reading "Enhance your GPS device"